Snooker's elite have been taking things easy before the World Championship gets under way on Saturday. But, while reigning champion Stuart Bingham and co have been resting up, the hopefuls have not been so lucky. After eight days and three gruelling qualifying rounds, the first-round draw is now complete and the top 16 know who they face at Sheffield's Crucible Theatre. BBC Sport looks at a few of the 16 qualifiers for the sport's showpiece event, including a couple of former champions and familiar faces, a possible fairytale winner and two rank outsiders. 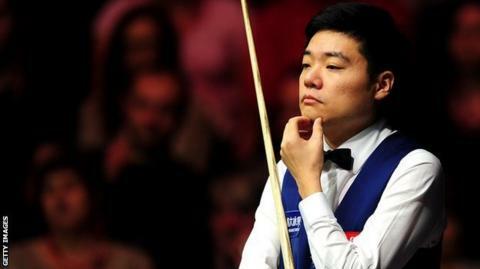 Ding Junhui was no doubt the draw that all the top 16 would have liked to sidestep. The former world number one, an 11-time ranking event winner, slipped down to 17 in the world after a miserable season and subsequently just missed out on an automatic spot. But his considerable talents were evident as he breezed through qualifying, clinching his place with a 10-2 thumping of former World Championship finalist Nigel Bond. Martin Gould awaits in the first round and the Chinese superstar will not be short of confidence. "It doesn't matter who I play," said 29-year-old Ding, who became the only player other than Stephen Hendry to win five world ranking titles in a single season in 2013-14. "They don't want to play me. "I feel good now having won three matches. I am scoring heavily. This has been good preparation and I'm ready for the first round." Birmingham-born Mitchell Mann is the only debutant in this year's tournament. World number 74 Mann was once on the books of his hometown football club, but he had to give up high-impact sport because he was diagnosed with Perthes disease - a hip condition which has meant numerous operations. Football's loss was snooker's gain and the 24-year-old had to show all his resilience and spirit to come through at Sheffield's Ponds Forge. A 10-7 victory over Kishan Hirani in the first round was followed by 10-9 wins in rounds two and three, with world number 23 Matthew Selt and the unpredictable talents of world number 52 Dechawat Poomjaeng both succumbing. Thankfully for Mann he will get some time to recuperate as his Crucible debut against Northern Ireland's Mark Allen does not get under way until Tuesday. "I am buzzing inside," he said after ensuring at least £13,250 - the biggest pay cheque of his career - by beating Poomjaeng and reaching the first round proper. "I have been working on the mental side and that really helped me keep my composure. "I played junior Pot Black there but I have never been live to watch. I will probably watch a few games when I am up there and really make the most of it." Two-time runner-up Ali Carter is one of the sports's best-loved and most-respected players, having twice overcome cancer and still been able to maintain his place among the world's best despite a constant battle with Crohn's disease. Carter will be making his 14th consecutive Crucible appearance and his pedigree and experience means he is fully justified in claiming that no-one would fancy drawing him. That honour falls to current champion and fellow Essex man Bingham. "To be back, considering the battles I have been through, means the world to me," said 36-year-old Carter. Kyren Wilson has had a breakthrough season, winning his first ranking event and storming up the rankings to world number 19. The 24-year-old secured his place by beating two-time runner-up Matthew Stevens 10-6 in the third round of qualifying and will play Joe Perry. "I am learning to deal with the pressure more and more - much better than I used to," the Kettering man told BBC Sport. "I have had a very solid season. All of a sudden I am getting to tournaments and people are saying 'he could win this'. I am getting to the latter stages of tournaments and holding my own against the top boys. "I think I was a little boy when I was there two years ago. I am getting married in June, I have a one-year-old son and they have turned me into a man." Former world champions Graeme Dott and Peter Ebdon are both in the mix once again. Ebdon takes on Marco Fu on what will be his 23rd visit to the Crucible, while Dott faces another former champion in world number 13 Mark Williams. "I am just so happy to get through," said Dott. "There will be easier games than me. My season will end at the Crucible, which is where it should end. "It hurts so much when you are not there. Last time I was not there it was devastating." Ebdon echoed Dott's words after showing his trademark grit and determination to come back from 9-3 down in the second qualifying round against Gerard Greene. "This has turned around a very disappointing season for me," he said. "It means so much. I missed out the last two years and that was soul-destroying because it's the zenith of our sport." Alan McManus, a two-time semi-finalist who first appeared at the World Championship in 1991, faces good friend and fellow Scot Stephen Maguire in the opening round. "After 20 times at the Crucible it's still a buzz although, it doesn't mean as much as it used to," he said. "I'll turn up and give it a go." The draw no qualifier wanted was five-time champion Ronnie O'Sullivan. "Anyone who says otherwise is kidding themselves," the Rocket's first-round opponent Dave Gilbert told BBC Sport. "When I picked myself up off the floor after about five minutes, I started laughing and then began looking forward to it. "No-one will give me a chance but I played really well in the qualifiers." But his run to the final of the International Championship in China last September showed his talent and has given the Tamworth professional greater belief. "If I can settle, I will give him a good game," added the world number 22. Robbie Williams, who plays Ricky Walden, and Sam Baird, who faces Michael White, will not be expected to go deep in the tournament but both feel they have points to prove. Merseysider Williams, 29, was a 10-9 winner over Nottingham's Anthony Hamilton in the final qualifying round and will make his third Crucible appearance. "On my debut I was battered by Neil Robertson, then last year I had a chance to beat Stuart Bingham but let the occasion get to me," said the world number 57. Baird, from Tiverton, Devon, was brushed aside by Bingham in 2013 and the world number 59 is desperate to show what he can do on his first return. He said: "I won't be intimidated by the venue this time, having been there before, and hopefully I will show what I can do this time."